Is this the end of Battenburg cake and mushy peas as we know them? Well, the answer may quite possibly be yes. Partiicularly if you like yours with the artificial colourings that have caused concern at the Food Standards Agency . I’m sure the manufacturers will find alternatives, but the original colourings currently used in products on sale now have a shorter shelf-life in the U.K.; as manufacturers are already talking about them being phased out by the end of 2008. They are used in foods such as mushy peas and Battenburg cake. A food safety watchdog has called for a Europe-wide ban on six artificial food colourings after research found a link with hyperactivity in children. A total ban on the use of the colours would have to be agreed by the EU. So the Foods Standard Agency wants UK ministers to push for voluntary removal of the colours by next year. In September 2007, a UK study reported children behaved impulsively and lost concentration after consuming a drink containing additives. In the study, 300 children were randomly given one of three drinks, either a potent mix of colourings and additives, a drink that roughly matched the average daily additive intake of a child of their age or a “placebo” drink with no additives. Their hyperactivity levels were measured before and afterwards, and researchers found that the drink with the highest level of additives had a “significantly adverse” effect compared with the placebo drink. 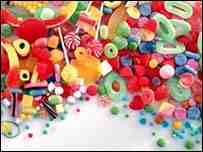 The six colourings concerned are found in many products such as sweets, confectionary, processed food and takeaways. In light of the research, the FSA advised parents of hyperactive children to be aware of the potential risks of consuming the colourings. But campaigners said more should be done. At a board meeting on Thursday, FSA chair Dame Deirdre Hutton said: “The evidence we have suggests it would be sensible for these [colourings] to be taken out of food. FSA board members explained that as EU legislation would take many years to come into force they wanted to see a voluntary “phasing out” of the colours as soon as possible. The European Food Safety Agency said in March that effects of the food colourings on children’s behaviour were small but, as the there were no nutritional benefits from the additives, there would be no cost or risk to the child in removing them from the diet. He said there was “a handful” of products, including mushy peas and battenburg cake, where it had not been possible to remove the colourings and the industry was concerned they would have to be taken off shop shelves. Mr Hunt warned that a UK ban would be at odds with the rest of Europe, as it would not apply to European imports. A spokesperson for the Department of Health said they would be asking the FSA to continue to work with industry to voluntarily remove the additives, particularly from children’s foods. Anna Glayzer, campaign co-ordinator at Action on Additives, said: “We are delighted that the FSA has put its duty to the consumer first in their decision to recommend an EU ban. banning mushey peas and cake couse of making children active…? what on earth the worlds coming to a end!! What a tragedy – Battenburg cake is my absolute favourite (nyum nyum nyum!). It’s health & safety gone mad. Whatever next? They’ll be stopping us from walking in the rain in case we slip over on the raindrops on the sidewalk. Great about time we had Peas the correct colour !!! It’s an awesome article in favor of all the internet viewers; they will get benefit from it I am sure. cake: e number ban affects 6 food colourings | Brand Tao <Liked it!